Cable News Network (CNN) is a major news cable television network founded in 1980 by Ted Turner (Robert Edward Turner III: born in 1938), US media mogul and philanthropist. The network is now owned by Time Warner. 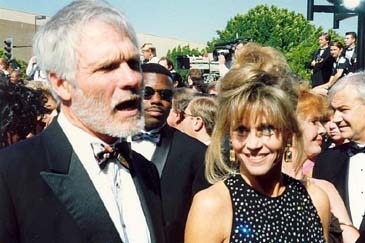 This file photo shows Ted Turner with his ex-wife (third wife) Jane Fonda in 1992. In the biggest expansion of international newsgathering resources in its 27-year history, CNN Worldwide today announced plans to significantly increase the number of correspondents worldwide, open a regional newsgathering hub in the United Arab Emirates, invest in a London-based digital-production unit, and make major investments in CNN's International Newsource and CNN's in-house wire operations. "This is all about owning more content; these new resources will have a huge impact across all of CNN's networks and platforms," said Tony Maddox, executive vice president and managing director of CNN International. "Owning the content we broadcast, publish and make available to affiliates and other platforms is the backbone of this business. This multi-million dollar investment in staff and resources bolster our world-class, award-winning journalism as well as give us the power to move swiftly into developing new business models." New operations are also planned for Afghanistan, Belgium, India, Kenya, Malaysia, Nigeria, the Philippines, Poland and Vietnam. CNN will also appoint two new correspondents for the network's Johannesburg bureau and add an additional correspondent at both its London and Istanbul bureaus. Investments are underway in CNN's Asia Pacific newsgathering hub in Hong Kong to increase staffing, and the network plans to assign additional correspondents in Beijing, Jakarta and Pakistan. At the same time, CNN is also revitalizing its Tokyo bureau to encompass additional reporting duties in South Korea to work within the current structure. CNN will significantly expand both its newsgathering and production facilities in the United Arab Emirates, bringing to bear more resources across the region in terms of programming and reporting, including more business coverage. CNN is also expanding its international online services with the creation of a digital production unit that will be primarily based in London, with additional staffing also in Hong Kong and Atlanta. This unit will produce and feed the rapidly growing number of new platforms that CNN services globally. This team will work alongside the television operation and will be responsible for providing content for CNN International, CNNArabic.com, CNNMobile and new CNN services on TV-to-broadband sites. CNN's International Newsource operation will also expand to provide additional editorial, content and newsgathering services to CNN's more than 1,000 affiliates worldwide. CNN's in-house wire service is also being strengthened with additional staff to ensure swift and accurate dissemination of all of the additional material becoming available across all of CNN Worldwide services and networks. In Mexico, CNN en Español will strengthen its presence with the hiring of an anchor and correspondent and an additional editor working from the network's Mexico City newsgathering bureau and production center. CNN en Español also will add to its editorial team in Atlanta to better service the increased volume of affiliate and stringer content and the development of new digital services. CNN is the world's leading global 24-hour news network and one of the world's most respected and trusted sources for news and information. The CNN brand is available to two billion people via 25 CNN branded TV, internet and mobile services produced by CNN Worldwide, a division of Turner Broadcasting System Inc and a Time Warner company.